Prison overcrowding is a problem for countries around the world, including the United States, where 30,000 California prison inmates initiated a hunger strike in July to protest solitary confinement policies at the state’s prisons. Now in its fourth week, nearly 500 inmates are still refusing meals. In May, the U.S. Supreme Court ordered the state to reduce its prison population, ruling the overcrowded conditions amounted to cruel and unusual punishment. 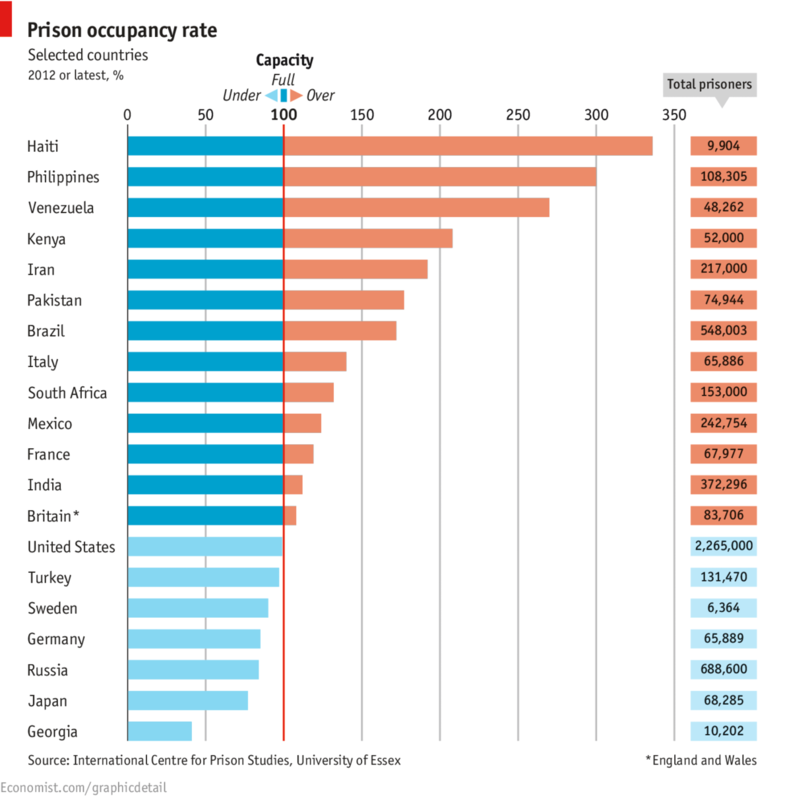 While California prisons are overcrowded, U.S. prisons overall are operating at 99% capacity, according to the International Centre for Prison Studies, putting the U.S. in the middle of a group of selected countries highlighted by the Economist in the chart above. Topping the list was Haiti, whose population of 9,904 inmates were housed in a system of 17 prisons operating at 336% occupancy level in 2009. The U.S. announced plans earlier this year to build two prisons in Haiti’s provinces as part of an international effort to ease the severe overcrowding that often requires inmates to take turns sleeping at night because of lack of space. Near the bottom of the list is Japan, whose comparatively roomy prisons have been likened to “Spartan retirement home[s]” with tiny, but spotless cells and a strict rule of silence. Japan’s prison population rate is 54 out of 100,000 citizens, compared to 716 in the U.S. Overcrowded prisons can be toxic for both prisoners and guards, according to a recent GAO report that found overcrowded conditions contribute to increased inmate misconduct, more competition for prison services such as educational or vocational training programs and a lack of meaningful work opportunities for prisoners during their incarcerations. Disease can also be a concern: tuberculosis rates can be 100 times higher in prisons than in the civilian population, and mental health and substance abuse issues are often more prevalent. Despite falling crime rates noted in a Pew Research Center analysis in May, the U.S. federal and state prison population has risen from 307,276 prisoners in 1978 to a high of 1.6 million prisoners in 2009, before declining slightly in the past three years. Note: The last paragraph of this post has been updated to clarify that the prison population figures cited include federal and state prisoners. The International Centre for Prison Studies estimated the local prison population at 735,601 in 2011.